Jen is bar manager at Red House in Paris. She makes two cocktails for us, one with Tequila and Salers and the second with Whiskey and Violet Cream. 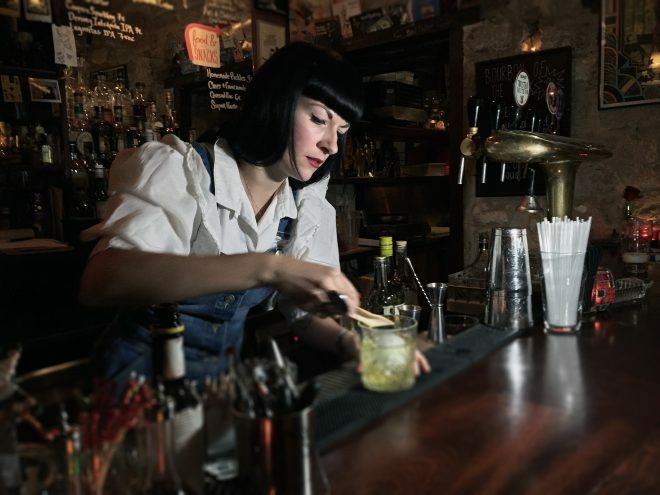 I’m Jen Riley and I’m the head bartender at Red House, which is an American bar that serves cocktails, craft beers and food in the 11th arrondissement, Paris. I started in hospitality in Manchester and decided to move to Paris to pursue a career as an artist. But after a while, art was not enough and I needed to keep a roof over my head, so got back into the industry. I started at Candelaria, who were doing things differently from everyone else in the bar scene at that time which inspired me. They offered me a role behind the bar and I stayed there for a year until I moved to Glass. After Glass, I worked shifts at various places before I realised I love this job too much and wanted something more permanent, so I took the job at Red House. I guess coming from England, one thing I’d love to re-create in Paris is a cocktail and craft beer bar with a genuine Victorian English pub vibe. You know what I mean… the beautiful hand crafted tiles, etched glass and lots of wood, with enough space for creating our own craft beers in-house, two to three work stations and seating for around 100 people (including some communal tables). I would also want to have a large open kitchen which served locally sourced food (I believe local produce is very important) and of course sunday roasts would be on the menu. Music wise it would have to be rock and roll, post punk and new wave. Usually we crack open a beer in the bar after service to decompress and after that I generally just like to chill. On weekends, I tend to go to galleries or check out new restaurants and bars. One of my favourite spirits at the moment is aquavit, because for me it’s quite unfamiliar and I like challenges. Number one for me is definitely balance. Number two would be creativity. I think the sign of a good drink is something people want to have again and again. Sherry. I love the diversity you don’t usually get with vermouths. I think my all time favourite bar to go to is the American Bar at The Savoy in London. You should also go to Toms Shophouse in Manchester and Medusa in Paris.